Aunque parezca mentira, The Doors tuvieron una trayectoria cronológica realmente corta, de tan solo ¡cinco años! ¿Qué ha podido ocurrir para que su música aún nos acompañe hoy en día, cuando la de tantos otros grupos más longevos ha caído en el olvido? 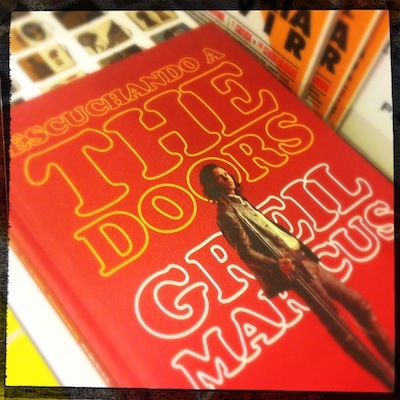 Para resolver esta cuestión, el siempre acertado (gracias a fans y pese a detractores) Greil Marcus se embarca en la aventura de analizar una música que considera, tantos años después, como "llena de vida". El peculiar autor norteamericano, que asistió en numerosas ocasiones a sus conciertos, pone como siempre, en un contexto mucho más amplio, su música, sus letras, su imagen y muy especialmente, por qué aún hoy en día les recordamos. Even though it seems difficult to believe, The Doors career was really short, lasting about five years! What is the reason that explains that their music is still alive and well, when the memory of so many long-lived bands has faded away? To solve this question, the always conspicous (thanks to his fans and despite his detractors) Greil Marcus has embarked in the adventure of analysing a kind of music that, so many years later, he still considers "full of life". This peculiar North American author, that attended many times to their shows, puts in a broader context, as always, their music, lyrics, aesthetics and quite specially, the reasons of why do we still remember them.